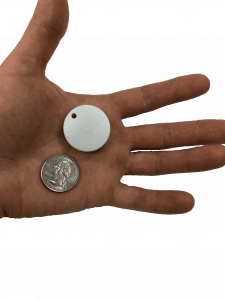 Easily tag any high value tool, asset or pallet with the revolutionary Mini IoT Tags and know at any moment the last location of your tagged assets. 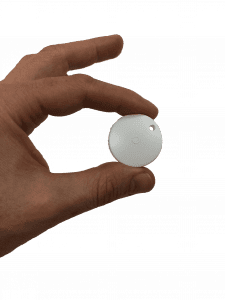 Tools & Asset Management – a service crew is dispatched to a job site with high value tools all tagged with a Mini IoT Tag. A Piccolo Plus telematics unit is installed in the vehicle that in addition of having the fleet management functionalities of: GPS, engine diagnostics, driver behavior and more, the Piccolo Plus is integrated with the latest IoT technology generating an IoT cloud establishing a continuous communication link between the Mini IoT Tags placed on the tools and the Piccolo Plus installed in the vehicle. When a tool is removed from the vehicle the communication link is broken and a message is being sent by the Piccolo Plus to Fleet.Net indicating the removal of that tool or asset. Once the vehicle is moving and that tool(s) was not returned to the vehicle the Piccolo Plus will send a message to Fleet.Net indicating that a tool or asset was left behind. Fleet.Net will then send a message to the driver’s phone via the DriverLink App alerting that a tool or asset has been left behind. Yard Management & Inventory – Tag every asset placed in a yard or depot and know the last location of that asset in that yard, know when it was dropped off or picked up and by what truck / driver. Know at all times your inventory of items placed in that yard. Shipment Monitoring – Tag every high value pallet and /or box and know the exact time and location that shipment was removed from the truck. Driver ID & Immobilizer – automatic log-in of an authorized driver allowing engine on. Automated Time Clock – easily record your drivers time-clock and know when and where their workday starts and ends. See what the latest IoT Technologies integrated with Telematics, Fleet Management & Asset Tracking can do to enhance your Fleet Productivity by reducing operational costs & cutting the risk of cargo loss and asset damage. Increase visibility into your fleet day to day operations and know where your high valued items are at all times. View, monitor and track in real-time the location and of your assets and see your entire asset inventory at a push of a button. Remove the need for manual record keeping by creating a unified, automated logbook. Ready to see how you can gain instant visibility into your fleet operations and increase fleet productivity?